Daily Mandatory Charge will be added to the room rate and includes Destination Marketing Fee. Daily Mandatory Charge will be added to the room rate and includes Destination Marketing Fee. The award-winning Embassy Suites Greenville Golf Resort - Conference Center is nestled in the foothills of the Blue Ridge Mountains on the spectacular Verdae Greens Golf Course. 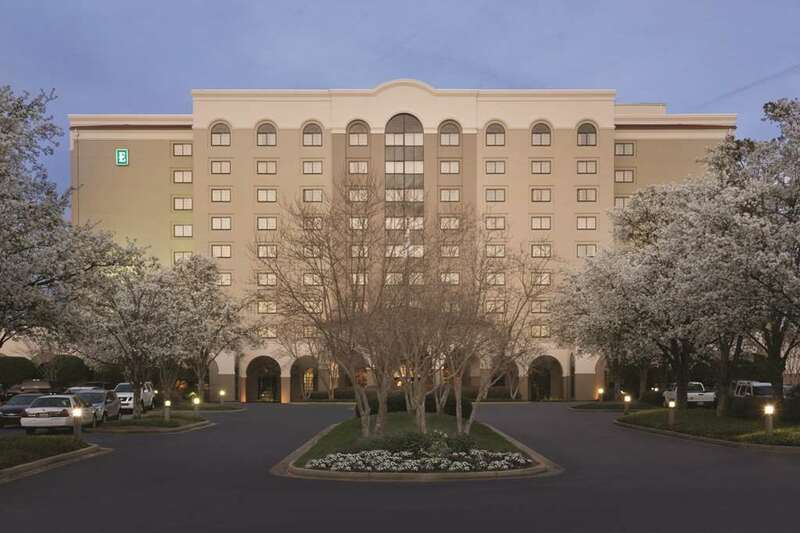 The Embassy Suites hotel is located one minute away from the International Center for Automotive Research and Millennium Campus and just minutes from Greenville - Spartanburg International Airport downtown Greenville SC and the Palmetto Exposition Center. Other area attractions include BMW*s Ultimate Driving Experience Hubbell Lighting Frankie*s Fun Park Roper Mountain Science Center and the Clemson University International Center for Automotive Research. Since opening in 1993 this hotel has been in the top 10 of all Embassy Suites hotels worldwide for overall guest satisfaction. With 268 spacious-two room suites over 20 000 square feet of meeting space and our own championship golf course this resort can meet your every need. Guests of the Embassy Suites enjoy a complimentary cooked-to-order breakfast and a nightly manager*s reception. High-speed Internet access is available throughout the hotel. At Embassy Suites Greenville Golf Resort - Conference Center exceeding your expectations is par for the course. The Grill at The Preserve: Just steps from the hotel and serving golfer-on-the-go lunch favorites daily such as hot dogs and deli sandwiches with a scenic view over our golf course. Enjoy a post round drink on the expansive Overlook Deck with views of 18 green and The Preserve at Verdae*s large practice putting green. Craft 670 Restaurant - Bar: Craft 670 is our on-site award winning restaurant specializing in the cuisine of the New South. Located in our open air atrium and also offering covered outdoor patio dining. Craft 670 is the ideal place to gather for a delightful lunch or dinner. Or dine outside and enjoy the Craft 670 Fireside Patio. In-Room Dining: Enjoy In-Room Dining courtesy of Craft 670 the Embassy Suites Greenville Golf Resort - Conference Center on-site restaurant for dinner.